Kudos to Nancy and Colin! The day had been a long one. 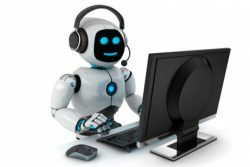 I was at the hospital with Nyel at 8:15 to give him a little assistance in sending his cardio mem information to Seattle – an electronic (magic) cyberspace communication with his Seattle cardiologist telling what the pressures inside his heart are. Then our Community Historian class at the Heritage Museum until noon – today all about the cutting-edge methodology for archival preservation of photos and documents. And then back to spend three more hours with Nyel – strategizing with caregivers about next steps. Home to work in the garden for an hour or two. Mostly clean-up that should have been done last fall. I can’t remember why I didn’t do it then… When I finally decided to think about dinner, I noticed that today’s Observer was still tightly rolled up the way our postmaster puts it in our mailboxes. I took a minute… and I’m SO glad I did. Nestled within the paper was the annual copy of our coast magazine. 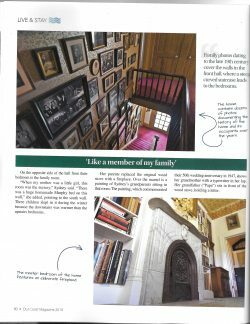 And on pages 86 to 91 is a marvelously illustrated article about our house! “Historic House In A Historic Village” is the title. I had all but forgotten the interview with author Nancy McCarthy and the follow-up photo session with Colin Murphey. It all happened last September and, somehow, we’ve had a few other things to think about since then. It seemed like a big surprise! When the Travel & Outdoors reporter Crystal Paul from the Seattle Times arranged to come for an “introduction” to Oysterville, I didn’t give much thought to which day she would be arriving – only that a Tuesday in July would probably be pretty typical. There wouldn’t be much going on in the village except for the stream of tourists in and out of the church. I was only partly right. She arrived mid-morning. The street was fairly quiet except for the building activity at the Hampson House next door to us and… the sound of children’s laughter coming from a line of kids in lab coats headed back to the schoolhouse. They had been checking out swallows’ nests on the buildings around town and documenting them with their cameras. The Oysterville Science Academy (OSA) in full swing! 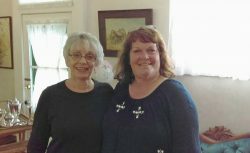 I introduced Crystal to Diane Buttrell, founder of OSA, who told her a bit about this year’s group of students – nine youngsters who will be fourth graders here in Peninsula Schools next fall. “Would it be all right to take some photographs?” She was given the green light – parents had all signed permission slips for such a contingency. We said we’d be visiting them at the schoolhouse after lunch. Lunch? After a tour of the village, we dropped by Oysterville Sea Farms. Salmon spread and rice crackers and smoked mussels for lunch! On the deck! A first, of course, for Crystal and a first also for us since Dan Driscoll’s troubles with the County began seven years ago!! Even though it was a gray day and the tide was out (WAY out! ), it was fabulous! We lingered, taking in the view of the village – the fronts of all the old houses that were built facing the bay – and the gorgeous, seemingly pristine shoreline to the east. Really fabulous! On the way back to our house, we stopped to see what the young scientists were up to. It was “Da Vinci Challenge Hour” and they were in the midst of a Chalk Talk – “Why do we classify things? How is classification useful?” They were sorting and classifying buttons and talking about the binary numerical notation system. Crystal took a gazillion photos and had a peek at their notebooks – scientific journals detailing every observation and experiment they had done thus far this summer. Reluctantly, we had to leave before they began to apply today’s classification discoveries in a “Design Your Own Store” activity. Wow! For a Tuesday in summer, there was a lot going on. But… come to think of it, there usually is in Oysterville! It’s hard for me to picture my great-grandfather, Robert Hamilton Espy, as a young, vigorous man. Let alone adventurous. Most of the pictures we have of him are when he was an old man. Even in his wedding picture, he looks quite staid and proper, as well he should have. 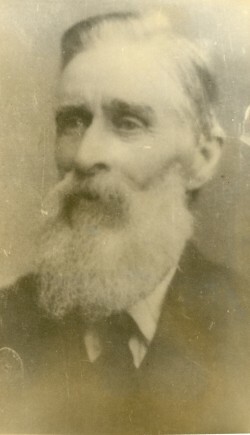 By the time he married in 1870, he was forty-four years old. Middle-aged by the standards of the day. But when Hamilton (Yes! That’s how he was listed on the 1855 muster roll for the Pacific County Reserve Volunteer Rifle Company) paddled northward on Shoalwater Bay with his twenty-six-year-old friend Isaac Clark, he was in his prime. He was twenty-eight and looking forward to a venture in the oyster trade. As they kept Espy’s rendezvous with Klickeas, it is doubtful that either man realized that their lives and the lives of their descendants would forever be associated with the shore where they made landfall. The date was April 12, 1854. The two men built a cabin of alder logs a few hundred feet from where they had landed and there they lived for next four years. Unlike the “Bruce Boys” across the Bay, Hamilton and Isaac were not opposed to sharing the Bay’s bounty and oyster prospectors converged on the area. In 1855 “Oysterville” (said to have been named by Elvira Stevens of the Stevens Hotel) was made the Pacific County Seat, shipped 50,000 bushel baskets of oysters to San Francisco, and quickly became the most important anchorage north of the Columbia River. Clark settled in almost immediately. He became a storekeeper, platted the town and, within four years, had married Lucy Briscoe and moved out of the ten-by-twelve-foot cabin he and Espy had continued to share. Espy, on the other hand, seemed not quite ready to settle down. 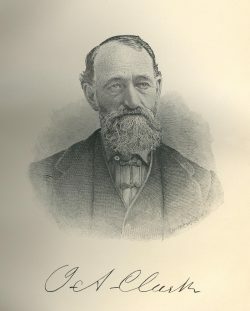 He busied himself in the oyster trade, invested in timber and city (San Francisco and Portland) real estate, served a short stint as County Sheriff, and was elected Major in the Oysterville Militia. During those early years, he took two “vacations” – once to the Blue Mountains to prospect for gold and, in 1859 after a bout with scarlet fever, he served for almost a year at the North Cove lighthouse at the mouth of the bay. 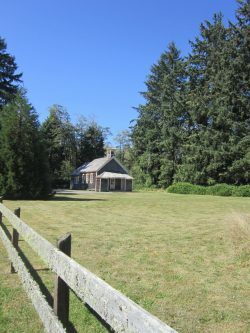 It wasn’t until he married the nineteen-year-old schoolteacher, Julia Jefferson, that he finally built a fine two-story house (still owned by his descendants) and moved out of the little cabin. Sorry. The cannon is indisposed. By rights, THOM (The Honorary Oysterville Militia) should gather day after tomorrow to fire their cannon in commemoration of Oysterville’s founding. It was April 12, 1854, according to accounts by both Isaac Clark and Robert Espy, that they paddled their canoe shoreward to the sound of Old Klickeas’s drumbeat. That foggy day, as far as we know, marked the beginning of a permanent settlement here. Worth noting with a cannon salute, eh? But, unfortunately, THOM’s cannon is confined to quarters for a time. After fourteen seasons – and not even the winter ones – out of doors in our northwest weather, her underpinnings are needing replacement. New carriage wheels! Nyel is ordering them today from an outfit in Pennsylvania and until they get here, the cannon will remain indisposed. Which means she will stay tucked away in our garage until the new wheels arrive. We have been custodians of the cannon– a full-sized replica of an 1841 mountain howitzer made by Cannon Ltd. of Coolville, Ohio – for some years now. We purchased it just in time to be used for Oysterville’s 2004 Sesquicentennial celebration. 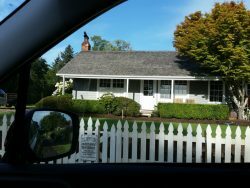 And, of course, as with most things in Oysterville, there is a story to go with it. 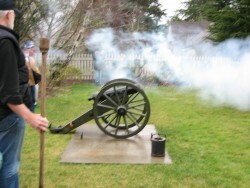 Oysterville has a long history of celebrations marked by cannon fire. 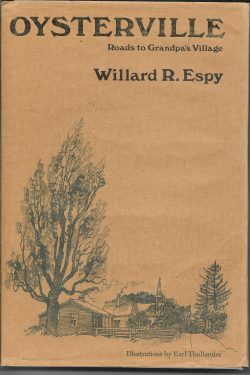 According to my esteemed late Uncle Willard Espy’s account in Oysterville: Roads to Grandpa’s Village, in the 1870s R.H. Espy would don special black broadcloth pants, a maroon and black brocaded vest, a light linen duster, a stiff shirt with boiled bosom, a stiff collar, a bow tie, and a beaver hat and would discharge the cannon to begin festivities such as the annual regatta. 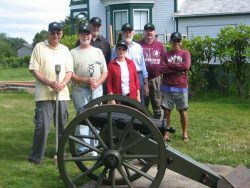 There are accounts that Oysterville’s original cannon was blown to bits by a rowdy group of midnight revelers, so for several generations we had to make do with only the stories about it. Hardly satisfactory thought Nyel. We happened to be in Gettysburg a few years before Oysterville was to observe the sesquicentennial year of its founding, and all those cannons on display prompted Nyel to make inquiries. 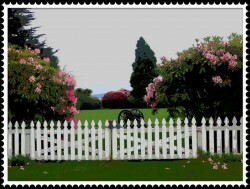 He learned that for a mere ten or twelve thousand dollars Oysterville could once again have a cannon. We pondered… and on the long road trip back home we conceived the idea of forming The Honorary Oysterville Militia. We would sell commissions to our friends and relatives and buy the cannon with the proceeds. General Nyel was the first to invest. The plan was successful beyond our wildest expectations and in early 2003 the cannon was ordered. It arrived in the spring of 2004, just in time for Oysterville’s 150th celebration. We’ve been celebrating loudly ever since! I remember specifically when I became aware of concept of ‘critical mass.’ It was 1952, I was sixteen years old, and I was working at the Cliff House Gift Shop in San Francisco. It was a summer job between my junior and senior years in high school and I used my mother’s old Plymouth to commute across the Golden Gate bridge to and from San Rafael where we lived. 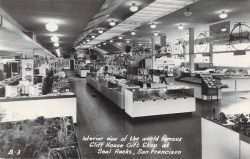 The Gift Shop was huge and sold every imaginable high-end souvenir to low-end tack – something for everyone. And, it seemed that ‘everyone’ came every day to the popular tourist destination out on Sutro Heights. 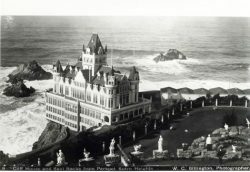 They spilled out of tour buses, they came in fancy limousines, they came to enjoy the view, to dine in the world class restaurant, or to take in the Sutro Baths which, by then (1952) had been converted to an ice rink. In my memory, my first-day orientation focused on the huge north wall of teacups and saucers – every one different and, as I was told, Big Sellers (capital B Capital S). A large, couldn’t-be-missed sign above the display said, “Lovely to look at, Delightful to hold, If you should drop it, We mark it sold.” I remember being traumatized by the thought that I might have to tell a careless customer that they would have to pay for their breakage. Days went by and, though I was busy ringing up sales at the old-fashioned cash register, not a teacup or saucer came my way. I couldn’t imagine why the manager had emphasized how popular they were. And then, one day I sold eight of them. And the next day, four. And, unbelievably, eleven on the following day! It was as though the dam had broken. But, just as quickly, the interest in teacup collecting abated for a few days. Then, it came again. In droves. 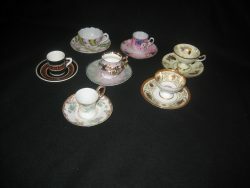 Not just one teacup here and another there, but many in a day – sometimes several to one customer. I remember talking to my dad about that. He was a sales representative for gift lines from India and he said that it was a common phenomenon in his line of work. Interest in an item happened in waves, he told me. The trick for the seller was to catch the crest. I don’t think Dad used the term ‘critical mass’ but that’s how I think of it now. Somehow, those runs on an item have to do with a size, number or amount large enough to produce a particular result (Merriam Webster Online Dictionary). Right now in Oysterville ‘No Trespassing” signs and their relatives ‘Private Property’ and ‘Keep Out’ seem to be the focus of many of our visitors. I’ve had at least a dozen questions in the last few weeks about the proliferation of those sorts of notices on the fences in the village. I can really only answer the ‘why’ of it with regard to the sign on our own gate. Years ago, when my mother and father were still living here, Mom walked into the living room to find a group of strangers who inquired about a tour of the house. They apparently had the idea that this was a museum. Our ‘Private Home’ sign has been on our gate ever since. I can’t speak to the others. Nor do I know if the critical mass phenomenon is in the sudden appearance of the signs or in the sudden noticing. Whatever the reason, those signs seem to be the focus of the month here in the village. 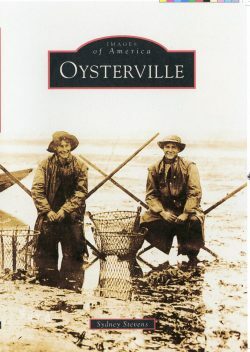 “Oysterville! Is that the name of your town?” asked Kelly-the-nurse in some disbelief. Nyel conceded that it was. 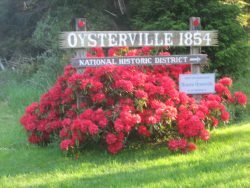 It always surprises me when I come across someone who has never heard of Oysterville – a testimony, for sure, to my self-centered nature. With 10,000 plus names added each year to the guest book at the Oysterville Church, it seems as though the whole world should know about Oysterville by now. But of course, they don’t. I suppose my surprise should be reserved for those who do know about our little village and I should be registering true amazement when someone says they’ve actually been there. Once upon a time, most of the folks one ran into in Portland had, indeed, been to Oysterville – or at least to the Peninsula. Now… not so much. Newcomers in Portland have outnumbered ‘the old guard’ and our little corner is not the primary get-away attraction it once was. 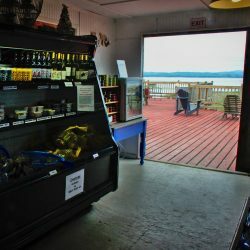 “So, I guess there are a lot of restaurants in Oysterville where you can get fresh oysters,” Kelly continued. Nyel and I exchanged a brief look. Brief, but loaded with past conversations about the one-time fabulous self-serve al fresco dining on the deck at Oysterville Sea Farms. Not to mention the on-going, relentless legal harassment by Pacific County of our neighbor Dan Driscoll, Sea Farms’ owner. Now, there’s a book that should be written! Certainly not a Romance. And not a Western or a Thriller or a Fantasy sort of book. Not even in the Mystery or True Crime genre. Maybe a new category altogether? Where are Carl Bernstein and Bob Woodward when we need them? Sailing. It’s a delicate balance in more ways than one. No wind and you are dead in the water. Too much wind and bad things happen. Like at yesterday’s Oysterville Regatta. Two broken tillers, two ripped sails, a broken boom and more dumps than we could keep track of. Everyone agreed that the 2017 Regatta will be talked about for years to come. I don’t really like the wind. It’s unsettling to me. So, living here on the beach where we have wind every day of the year is a little bit challenging. On the other hand, I love the recreational activities associated with wind. As a spectator, only, I hasten to point out. I love to watch the kites flying at the ocean beach and remind myself that it’s not an accident that The International Kite Festival was born here and has been a huge success, year after year. 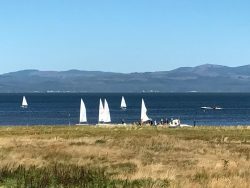 And where else but on Willapa Bay could there be a regatta – dated (intermittently, to be sure) from the 1870s? And where but Oysterville would you find a whole family of sailors whose great, great-great, and three-times-great grandfather participated in some of those early regattas of 140 years ago? But, during yesterday’s regatta, I was very happy to be enjoying the spectacle from dry land. 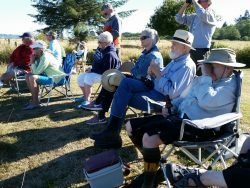 Oysterville’s event is pretty bare bones – no microphones or fancy visual enhancement aids at the seashore. We walk to the end of the lane laden down with chairs, binoculars, something to eat and/or drink and buoyed up by high anticipation. Tucker, who is Admiral of the Fleet, supplies a list of sailors, boats, and sail numbers by which to identify who is where. Periodically, Tucker would leave his post at the waterside and come and tell us what was going on. But it wasn’t until the Awards Ceremony last night that we learned that only one boat has finished the first relay race! One out of six starters. And… he had to be towed into the bank once he crossed the finish line because of … wind damage! All agreed that Chris Fuller more than earned his trophy! What a day! It’ll go down in history! I’m sure of it. 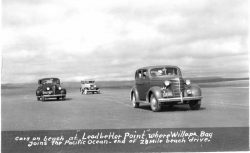 It’s been seventy years since my Uncle Willard Espy began painting the town red. Well… maybe not the whole town of Oysterville, but certainly two of the most significant buildings in this little village. It was 1947, the year of his parents’ fiftieth wedding anniversary. The celebration was to take place around Thanksgiving and, even that summer, preparations were under way. At that time, Willard owned his grandfather’s house up the street a block or so from where he and his six siblings had grown up. He and his (then) wife, Hilda Cole Espy, had purchased the house from the R.H. Espy Estate shortly after World War II. Or maybe during the war – I don’t really remember. What I do remember is that for several summers in a row (including 1947) their four daughters – my ‘much younger’ cousins were here, as was I. Willard, wo was then Public Relations Director for the Reader’s Digest in New York. He took his vacation weeks here and, that year, he painted the R.H. Espy House red. I was eleven that year and I don’t specifically remember the painting project. My oldest cousin, Mona – never mind that she was a twin; she took great pride in being the eldest daughter, even if only by a few minutes – was six and she does remember. Sort of. She remembers her father laughing and laughing after painting the horns of the bull out in the pasture – red! We both think that Willard had taken a break from painting the house to have a little fun with the neighbor’s bull and, in our minds, that dates the year that the house color changed from yellow (we think) to the red it is today. 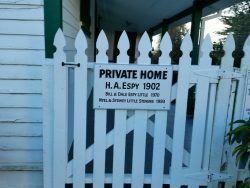 For the next thirty years, people referred to the R. H. Espy house as the “Red House” because it was the only one of that color in town. 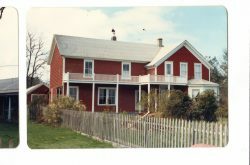 Then, in the mid-seventies, Willard and his (then) wife Louise purchased the little cottage that had once served as the first courthouse in Oysterville. 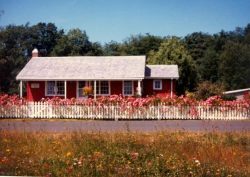 It, too, was soon painted red and we began to refer to the two structures as “The Big Red House” and “The Little Red Cottage” to distinguish which we were talking about. Yesterday, as we drove into town after being gone for eight days, there were indications are that we will not need to differentiate between red buildings from this point forward. We noticed that the erstwhile “Little Red Cottage” now has a gray façade – perhaps the first step in the newest owners’ renovation scheme. For now, the rest of the house remains red – a two-toned look that is distinctive in itself. Whether in his parents’ home, his grandfathers’ home or the erstwhile first courthouse, Willard spent much of his life here in Oysterville. He, himself, grew gray over his long lifetime and I think he would be amused to think that his beloved Red Cottage had now entered its own gray stage. Like Willard, himself, it’s looking quite dignified and distinguished in gray! 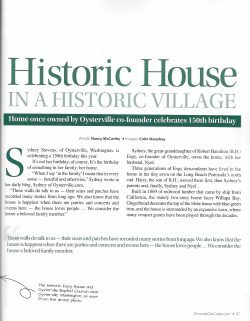 Sometimes I feel that Oysterville must qualify as the Espy Family Seat – the place Espys come when they are on the search for family information. Or maybe, as my sainted Uncle Willard claimed, all roads lead to Oysterville when it comes to Espys. I’m not sure the reason, but one way or another, we get to meet a lot of fabulous Espy relatives. Yesterday, it was Debi Snyder, a fifth cousin twice removed (is that what we decided?) who is on a road trip from Provo, Utah with her husband Ron. Our common ancestors are Thomas Espy and Anna Hamilton – Debi through their son William and me through their son Robert. That much is well-documented, apparently, so there is no question of our cousinship. The big question among the genealogists seems to be about Anna Hamilton Espy’s parentage and that was part of the reason that Debi looked me up – hoping for a family Bible or other documentation (Sorry! Not here!) that would firmly establish Anna’s parentage. That her father was Alexander Hamilton (not the famous one) seems to be true. It also appears that for some years in the 1750s, after Anna’s mother died and while Alexander was off fighting Indians, young Anna lived with his parents, presumably her grandparents. Anna rejoined Alexander (presumably her father) in 1760 when he remarried a woman named Amanda and began his second family of . As far as my newly-discovered cousin and I are concerned, Anna’s parentage is neither here nor there. But, Debi’s sister is apparently interested in qualifying for the Daughters of the American Revolution. Being descended from Alexander Hamilton (not the famous one) seems to qualify you and until recently that’s been a fully legitimate reference. But now, apparently, the DAR is questioning Anna’s paternity and until it’s all resolved… no acceptance by the DAR. I’m afraid I hold a “so what?” view of that entire DAR thing and my new-found cousin seems to agree, though she is pursuing the documentation quest out of sisterly loyalty. My father’s mother was a passionate and active member in the DAR and, when I was a teenager, was eager for me to join. I had absolutely no interest then or now. 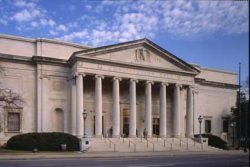 In my mind, the DAR is forever tainted by their treatment of opera singer Marian Anderson back in 1939 when they denied her the opportunity to perform in DAR Constitution Hall because of her race. Actually, that fact has shaped many of my decisions through life. I chose Stanford because it didn’t then have sororities; I have never joined AAUW and in several (though not all) other instances I’ve tried to avoid ‘exclusive’ groups which set their members apart from the rest of the world. But that’s another story… Yesterday I was proud as punch to be a member of an even more singular group – the Espys – and to welcome yet another cousin to the seat of the Oysterville branch of the family! Headed north for the bridge??? Some of the local wags probably still direct tourists to Leadbetter Point when asked about the bridge over to North Cove and Tokeland. I must say, it is tempting advice to give. I wish I had a nickel for all the drivers who have stopped me as I walk toward the post office to ask if this is the right road for the bridge. Often, they have a map in hand and, usually, they argue with you when you tell them there is no bridge. It’s hard to be polite when you know they are thinking “Dumb Yokel!” and you are thinking… well, never mind what you are thinking. After waiting a suitable time (two weeks) for my payment to show up, I emailed a polite query that got this response: Due to the high volume of inquiries we receive on a daily basis regarding Royalties, please allow 5 business days for a response to your email sent to the Royalties Department. So, I waited some more. After eight business days without a peep, I called the phone number that was included in the email.